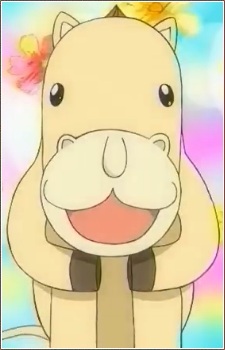 Umagon (Ponygon in English dubl) is a mamono who resembles a small horse, donkey or a sheep according to Kiyomaro's friends. Umagon can only speak "Meru meru mee". Umagon's real name is "Schneider," as it is revealed in the flashbacks that his mother calls him so. Umagon is seen many times throughout the series following Gash Bell around, but he was not officially introduced until episode 23. His human partner is Kafka Sunbeam. In the manga, Umagon discovers Gash at the end of his trip in England, but the anime introduced Umagon in Japan earlier to show him off while following him and Kiyomaro to England to follow with manga continuity.